PROBLEM: Our Keurig 2.0 is not working. My Keurig 2.0 is not compatible with certain k-cups. We bought some off brand k-cups and they do not work. It says OOPS NOT COMPATIBLE. So we put those aside and we tried the ones that Keurig approves of but it will still not brew any of them correctly. It does NOT say incompatible, it shows the screen to choose cup size and brew strength. 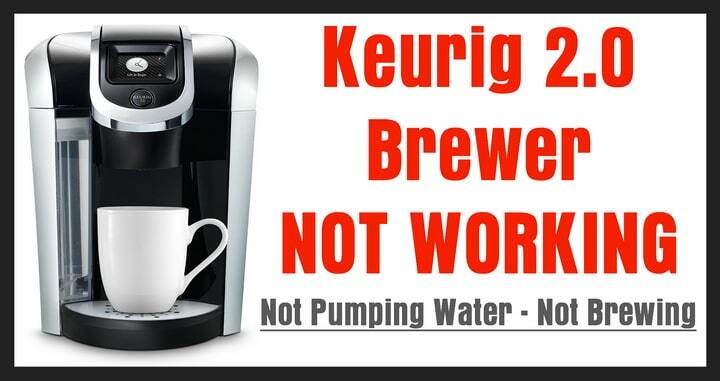 However, when we press the BREW button, it will not brew any type of approved Keurig k-cups. A small amount of water comes out but it does not pump the water or brew correctly. The water that does come out is hot so I know the heater is working. The screen works just fine. It only dispenses a small amount of coffee when it gets to the drip portion. Nothing happens during the main dispensing portion. I have only had this Keurig for 1 month. Did the incompatible k-cups break the coffee maker? 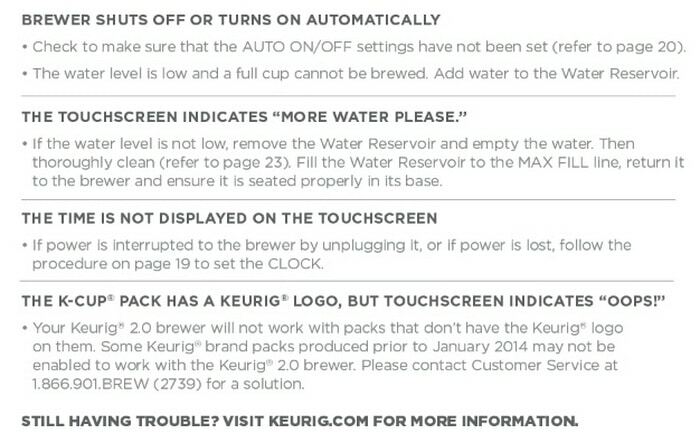 SOLUTION FOR KEURIG NOT WORKING: If your Keurig 2.0 is plugged in, the water has pre-heated, the screen is lit up and you press the large BREW button, and it does not brew the coffee or pump out the water as it should, you have may have a clog somewhere in the machine. 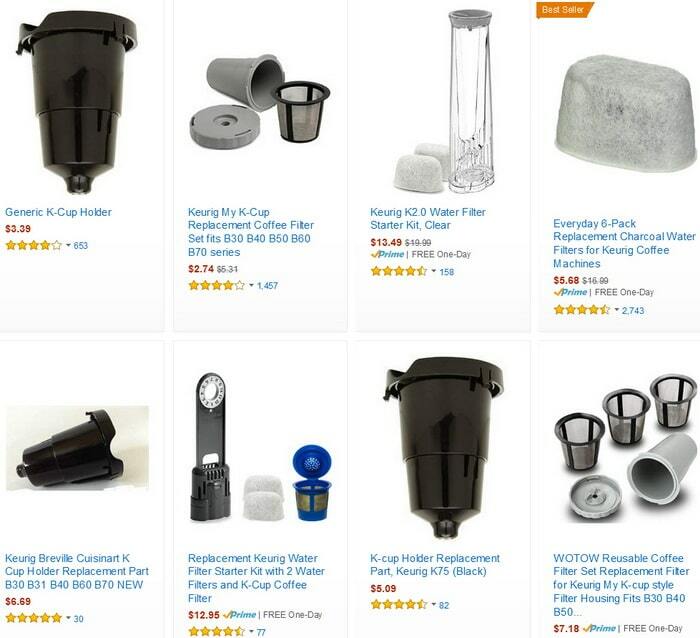 If you are using the approved k-cups and the coffee maker still will not brew or pump the water correctly, you most likely have a blockage somewhere and the coffee maker needs to be cleaned out or reset. 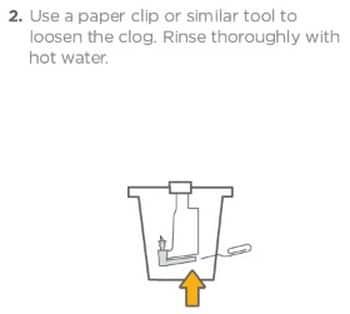 Try the methods below to either reset or clean out your Keurig. 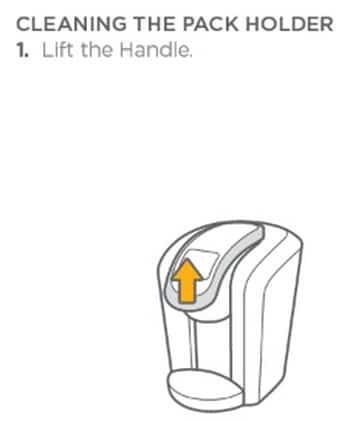 Keurig owners manual in PDF for troubleshooting, cleaning, programming, and descaling. Add 8 ounces of vinegar to the water tank and brew 4 times. Next, fill the water reservoir with drinking water and brew large cups of only water until the water reservoir is empty. By doing this it will flush out any vinegar taste from the machine. When you are finished running water through the machine, the needle should be cleaned out and the clog will be eliminated. 11 – IF ALL FIX METHODS FAIL – Call Keurig at 1-866-901-BREW (2739) or email them at CONTACT KEURIG and see if the brewer is still under warranty. When you call, the recorded message will not say anything about warranty claims. Listen for when the recorded call says REPLACEMENT PARTS and press that option. Give the Keurig call service center representative the SERIAL NUMBER of your Keurig Brewer. (Serial number is usually located behind the water reservoir) They will then look in the database and see if your Keurig Brewer is still under warranty. If it is under warranty, they will send you a replacement brewer but only in black for some odd reason. 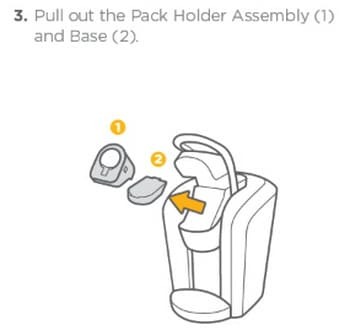 They do not require you to send the complete coffee maker back, only the k-cup pack holder. Plug brewer into an independent outlet. Check to be sure that it is plugged in securely. Plug into a different outlet. Reset your home’s circuit breaker. Make sure that the Power Switch has been turned on and the LCD Control Center is illuminated. Check to make sure that the Auto Off timer and/or On/Off time features have not been set. Press the MENU Button and scroll through the programming options. “OFF” should be indicated for Auto Off timer and On/Off Time. 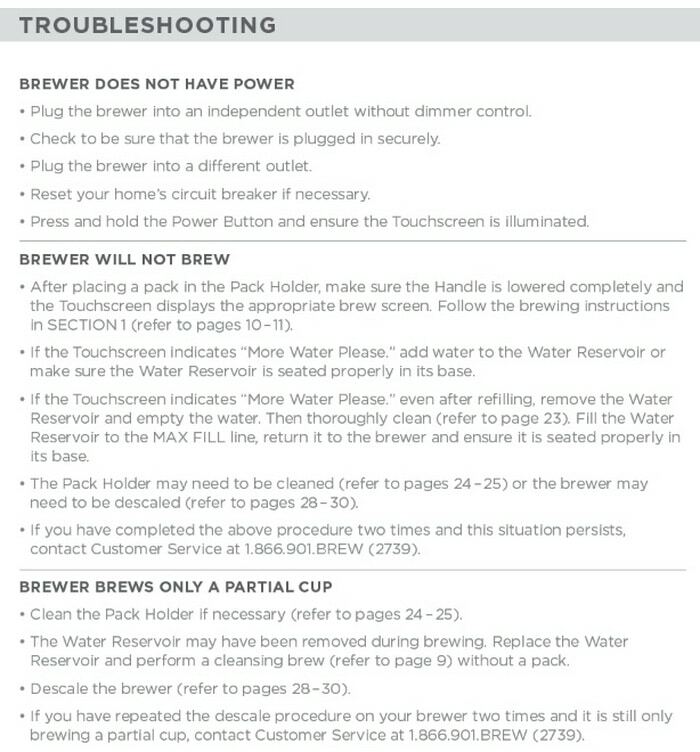 If “OFF” is not indicated, reset brewer. 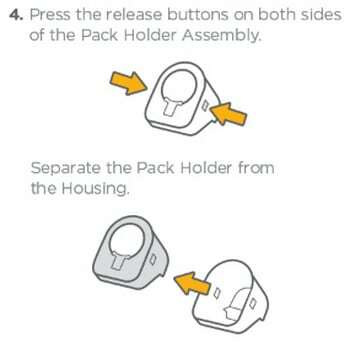 After placing the K-Cup pack in the K-Cup Pack Holder, make sure the handle is pushed down securely. Make sure the LCD Control Center indicates “READY TO BREW”. Then press the BREW Button. If the LCD Control Center indicates “ADD WATER,” add water to the Water Reservoir. Fill to and not beyond the MAX FILL line. Make sure the Water Reservoir is seated properly in its base. If the LCD Control Center indicates “ADD WATER” even after refilling, contact Customer Service at 1.866.901.BREW (2739). The Exit Needle may be clogged. If the LCD Control Center indicates “MORE WATER” and the blue light in the Water Reservoir is flashing, see below. Completely remove the Water Reservoir and thoroughly clean. Ensure the Water Reservoir is filled to and not beyond the MAX FILL line. 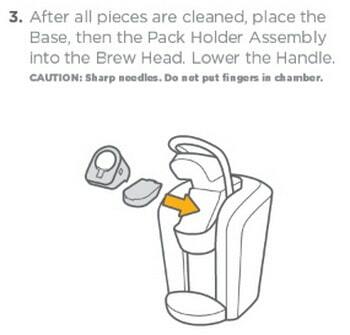 Return it to the brewer and ensure it is seated properly. If you have completed the above procedure two times and this situation persists, contact Customer Service at 1.866.901.BREW (2739). 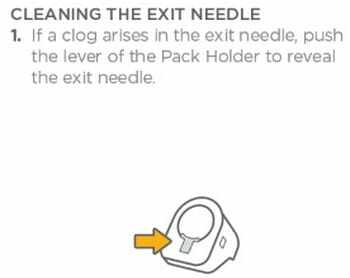 The Exit Needle may be clogged. 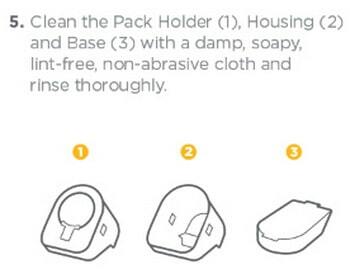 Clean the K-Cup Pack Holder Assembly if necessary and rinse under water. The Water Reservoir may have been removed during brewing. Replace the Water Reservoir and perform a cleansing brew without a K-Cup pack. If you have repeated the descale procedure on your brewer two times and it is still only brewing a partial cup, contact Customer Service at 1.866.901.BREW (2739). As you can see, in our situation they do not want the complete coffee maker shipped back. Keurig only wants the K-cup Pack Holder. So, if your brewer breaks, you will have an almost complete 2.0 brewer on hand that you can use for spare parts in the future if needed. 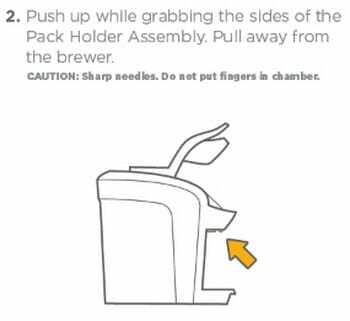 Having problems with your Keurig Brewer? Please leave your questions below and we will be happy to assist you in getting your brewer working again. 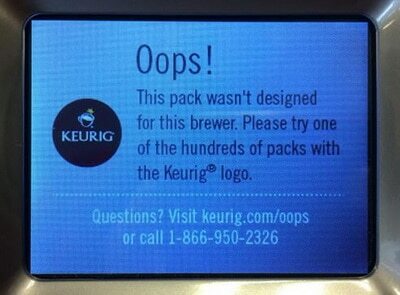 My Keurig says sorry the Brewer appears to have a problem. Please unplug your Brewer and call us at 1866-901-brew for additional instructions. Any ideas? So I have a Keurig 2.0 and if I just hit hot water it pumps heavy quick flow. When I make coffee however it takes like 5 .minutes and it pumps then stops then pumps then stops and then eventually just drips for one or two minutes before it says it’s ready. Any ideas? So my Keurig 2.0 will not conduct a hot water cycle. I lift the handle remove pod and put handle down and it is in “brew” mode. Super aggravating because I cannot find help for this anywhere on line. Your Keurig 2.0 may have a burnt out heating element. Contact Keurig Customer Service with questions: (7 a.m. – 12 a.m. EST) 866-901-BREW (866-901-2739). My Keurig Model 2.0 will not heat up. It says pre-heating but starts sp[ting out water and can only stop the water flow by pulling the plug or it will just empty the water receptacle and over fill the cups? My keurig only seems to work with Folgers pods , all other pods leaves coffee grounds in the cup , like mccafe and maxwell house ?? My Keurig 2.0 is stuck in “pre-heat mode”. I have already taken it apart, cleaned it and descaled with vinegar wash.
Is the Keurig pumping water out or it will just not make hot water? Can you make a cup of coffee? What happens when you press the button to brew, the Keurig heats the water, and then you press the button for HOT WATER? Does the Keurig not respond? 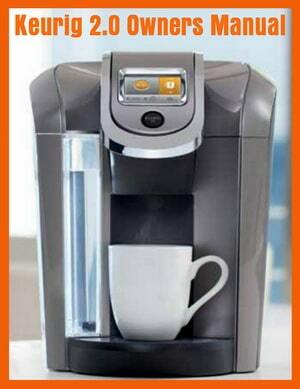 Did you leave a k-cup inside the Keurig? Is it programmed correctly for the HOTTEST water possible? Check in the INFO screen and make sure the settings are correct. 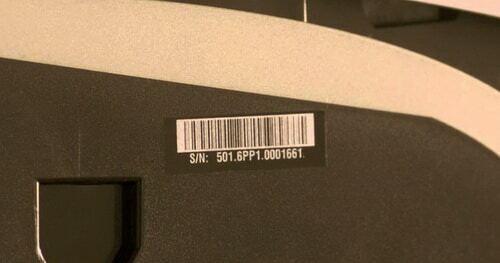 Previous post: Samsung Front Load Washer Error Code dS or d5 – How To Clear?